A highly sensitive voltammetric sensor based on chemically synthesized gold nanoparticles is proposed for determination of arsenic and copper by using anodic stripping voltammetry (ASV). Optimal conditions for determination of As (III) and Cu (II) have been selected. The detection limit for arsenic and copper is 0.05 ppb for the 30 second accumulation time. 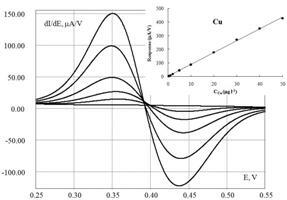 Dependence of the response for As (III) on concentration is linear in the range of 0.2 - 20 ppb, for Cu (II) - 0.2 - 50 ppb. The sensor is used for ASV determination of arsenic and copper in drinking and natural waters.